The Ballastone Inn. Photo by Andrea Six. 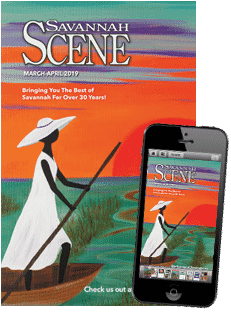 In the age of Airbnb, Marriott rewards and hotel clog, guests certainly have options when they opt to experience Savannah and her Southern sister cities. The argument of hotels compared to bed and breakfasts is more relevant than ever in Savannah’s competitive market. For many, this raises the expectations of hotels and bed and breakfasts and their role in guests’ vacations. One of the hot buzzwords in the hospitality industry, “personalization,” shows the increase in tourists who don’t just seek out a place to shower, sleep and eat. 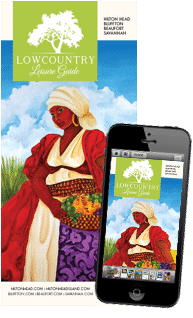 The experience offered at an inn or hotel is composed of customer-service intimacy, with more personal preferences applied to typical visitation itineraries. Perhaps few understand this business in Savannah better than Jennifer Salandi, owner of Savannah’s Ballastone Inn. 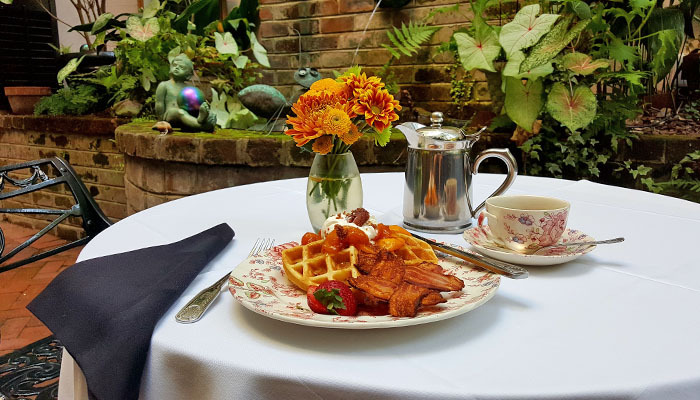 The Ballastone, the Juliette Gordon Low Birthplace’s next-door neighbor, is one of over a dozen bed and breakfasts in the Historic District, and Salandi knows firsthand the “inn’s” and out’s of operating quality hospitality in an antique setting. Under Salandi’s management, the Ballastone Inn boasts an AAA Four Diamond Award, two commemorative plaques (from the Historic Savannah Foundation and the National Trust) and consistently positive reviews from guests, many of whom are now regulars when visiting town. Breakfast at the Ballastone Inn. Photo courtesy of the Ballastone Inn. Salandi credits the more personal approach of bed and breakfasts for the success of her inn, which she acquired in 2001 along with her former husband. Her history with the Ballastone stems from her initial love for bed and breakfasts and the impact they have on guests. From the moment she stayed at her first B&B in California in 1980, Salandi dreamt of running her own inn. She didn’t acquire the Ballastone until 2002, because she followed her husband’s career for 20 years after her B&B baptism. The Ballastone Inn. Photo courtesy of the Ballastone Inn. Part of the intimacy of a B&B derives from its homey atmosphere. With this in mind, Salandi keeps the Ballastone furnished and decorated to reflect its original 19th century flair. Salandi said guests often walk around the inn and just stare at her decor. The interior decorating also immerses them further into their Savannah stay. 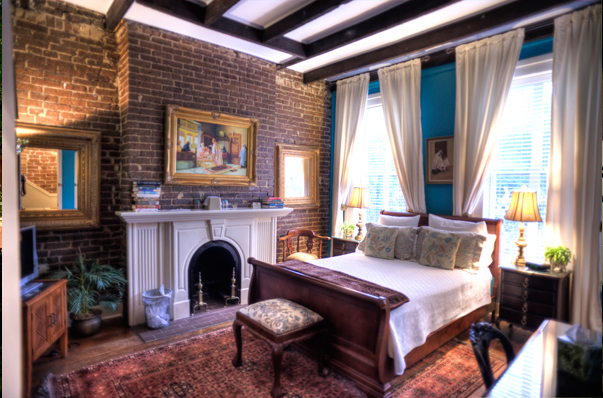 A memorable guest said it best when he told Salandi that despite having thousands of chain hotel points,Savannah B&B Inn Suite he chose the Ballastone for its intimacy. The Savannah Bed and Breakfast Inn. 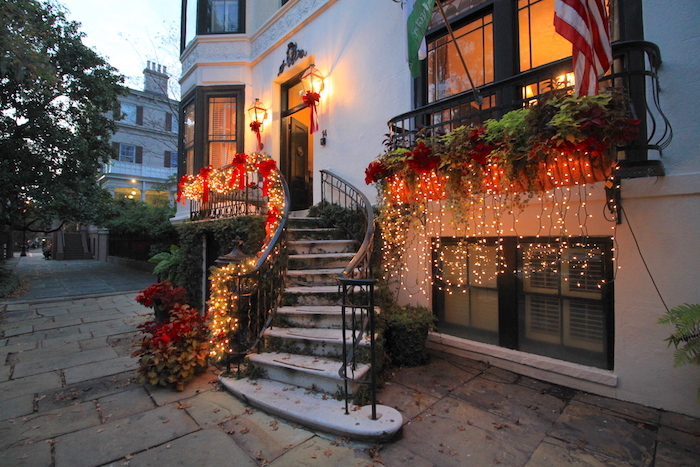 Photo courtesy of the Savannah Bed and Breakfast Inn. Another voice from team B&B is Elizabeth Wells, marketing director at the Savannah Bed & Breakfast Inn. Wells, a self-proclaimed avid traveler, is not shy about her love of bed and breakfasts and their cozy ambience. 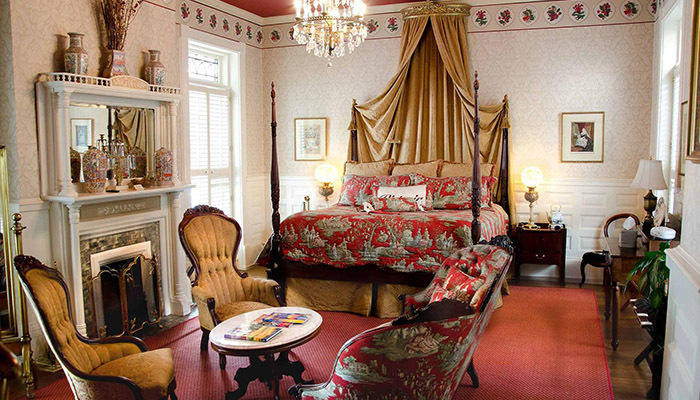 Like Salandi’s Ballastone, Wells’s Savannah B&B is consistently ranked highly for their location and staff. 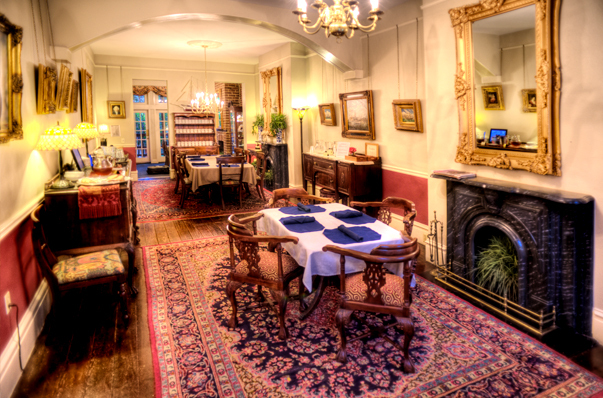 Located adjacent to Chatham Square, the inn is known for their Southern hospitality. Of the benefits of staying at a b&b, Wells said the inclusion such as homemade breakfast, parking and Wi-Fi add the comfort of a home-away-from-home. She also advises those looking into lodging at a B&B to pay close attention to location and staff when doing their research. Now running the Ballastone on her own, Salandi believes the benefits of staying at a b&b boil down to a single word: convivial. Meaning that of a friendly atmosphere, the word perfectly sums up how Salandi sees her second home.